Alley and Matt were married at Alley's childhood home in Yellow Sulphur Springs that could double as an exclusive wedding venue. Just looking through the wedding photos put a big smile on my face. For the cake, they chose a lovely three tier rustic buttercream cake with fresh wildflowers and gold dusted blackberries. Their family and friends enjoyed almond cake with blackberry filling and chocolate cake with mocha filling. I just love the custom wooden "Broomell" cake topper that symbolized the beautiful tree that they were married under. Tasher and Cory were married Nesselrod Bed & Breakfast in Radford, Virginia on a beautiful May day. The wedding took place at the gazebo with the reception to follow in the sunken garden surrounded by gorgeous landscaping and a lovely waterfall. The guests enjoyed a very yummy dessert bar filled with the couple’s favorite sweets. They had cake pops in flavors of Almond Joy & Reese’s as well as chocolate, vanilla, almond & red velvet cupcakes with vanilla bean buttercream. They also had chocolate chip & snickerdoodle cookies and "Papa's Favorite Brown Sugar Cake” shaped to represent a rotary engine. If you are still looking for a professional to make your wedding cake in Roanoke, Salem, Vinton, Blacksburg or Radford Virginia call me at 540-493-6812. Take a moment to check out my wedding cake gallery and see what other couples are saying in Roanoke, Virginia about their wedding cake experience. I am one of the most popular wedding cake bakers in Roanoke, Virginia and I would love the opportunity to work with you on such a special occasion. Their guests enjoyed almond cake brushed with Amaretto liqueur and filled with vanilla Swiss meringue buttercream. An assortment of local strawberries, blue berries, blackberries and raspberries adorned each tier and filled the top. The entire cake with dusted with powdered sugar for a lovely finishing touch. If you are still looking for a professional to make your wedding cake in Roanoke, Salem, Vinton, Blacksburg or Radford Virginia call me at 540-493-6812. Take a moment to check out my wedding cake gallery and see what other couples are saying in Roanoke, Virginia about their wedding cake experience. For more wedding ideas personalized to your event vision, contact me sarah@freshabakedva.com. The Roanoke Country Club is one of my favorite venues for an intimate wedding in the Roanoke Valley. Amy and Alan hosted their ceremony and reception in the beautiful ballrooms and enjoyed the outdoor patio with the backdrop of the Blue Ridge Mountains. Amy's sister, who is a graphic designer, custom made the cake topper to include all her furbabies (so sweet). Their guests enjoyed dark chocolate cake with a rich chocolate ganache filling! I love to hear from my couples after the wedding! Incredible details abound in this modern winter shoot featured on Ruffled Blog, a wedding blog for stylish brides and creative couples. I am so excited to be featured alongside the very talented Nicole Colwell Photography and Gloriosa. I love to collaborate with other talented wedding vendors to bring a vision to life. Nicole Colwell Photography and Gloriosa are the brains (and talent) that brought this exceptional idea to life. From the brides evergreen skirt to the gorgeous place settings, this shoot is far from drab and puts a new spin on saying "I do" in the winter. The cake was inspired by couples unique wedding invitations and features a double barrel tier, measuring 8 inches tall, decorated with a deer silhouette and sugared berries. The two coordinating naked cakes are topped with sugared berries and fresh cinnamon sticks. We finished off the table with white chocolate cranberry cookies and tall glasses of milk. Check out the full photo shoot here where was featured on Ruffled Blog. Pink continues to be on trend for 2016 weddings and is perfect for girly brides who are looking for a romantic wedding cake. Pink is an easy color to incorporate into your wedding cake through fresh flowers, hand-painting or buttercream accents. Using pink flowers is a great way to add color as many fresh flowers are available in multiple shades of pink. Pink color variations are endless from a bright raspberry color to soft blush pink and many gorgeous shades in between. You can combine metallic's with a hand-painted design, or choose a cake that is decorated with rustic buttercream and pink sugar peonies. 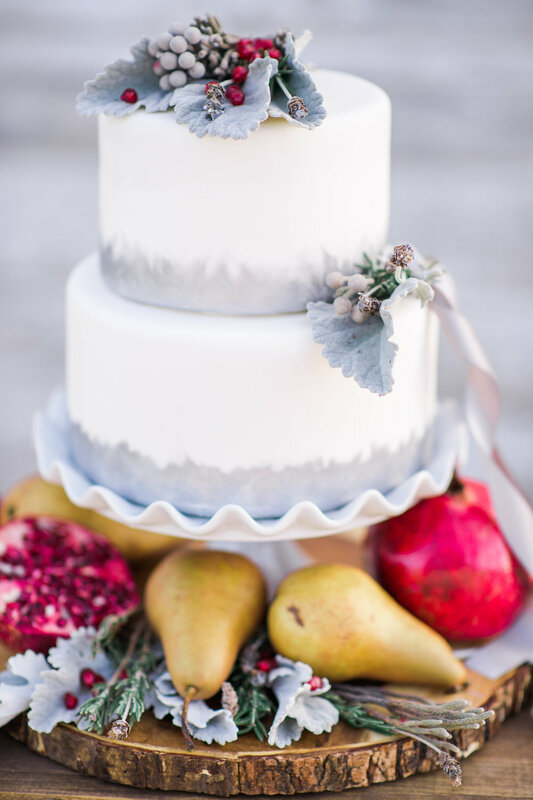 View my gallery for wedding cake inspiration.